The Critical Bookstore is Howells's interesting story about whether books, like other consumer products, should come with a money-back guarantee. It had long been the notion of Frederick Erlcort, who held it playfully, held it seriously, according to the company he was in, that there might be a censorship of taste and conscience in literary matters strictly affiliated with the retail commerce in books. When he first began to propose it, playfully, seriously, as his listener chose, he said that he had noticed how in the great department stores where nearly everything to supply human need was sold, the shopmen and shopwomen seemed instructed by the ownership or the management to deal in absolute good faith with the customers, and not to misrepresent the quality, the make, or the material of any article in the slightest degree. A thing was not to be called silk or wool when it was partly cotton; it was not to be said that it would wash when it would not wash, or that the color would not come off when it would come off, or that the stuff was English or French when it was American. When Erlcort once noted his interest in the fact to a floor-walker whom he happened to find at leisure, the floor-walker said, Yes, that was so; and the house did it because it was business, good business, the only good business. He was instantly enthusiastic, and he said that just in the same way, as an extension of its good faith with the public, the house had established the rule of taking back any article which a customer did not like, or did not find what she had supposed when she got it home, and refunding the money. This was the best sort of business; it held custom; the woman became a customer for life. The floor-walker laughed, and after he had told an anxious applicant, "Second aisle to the left, lady; three counters back," he concluded to Erlcort, "I say she because a man never brings a thing back when he's made a mistake; but a woman can always blame it on the house. That so?" Erlcort laughed with him, and in going out he stopped at the book-counter. Rather it was a bookstore, and no small one, with ranks of new books covering the large tables and mounting to their level from the floor, neatly piled, and with shelves of complete editions and soberer-looking volumes stretching along the wall as high as the ceiling. "Do you happen to have a good book--a book that would read good, I mean--in your stock here?" he asked the neat blonde behind the literary barricade. "Well, here's a book that a good many are reading," she answered, with prompt interest and a smile that told in the book's favor; it was a protectingly filial and guardedly ladylike smile. "Yes, but is it a book worth reading--worth the money?" "Well, I don't know as I'm a judge," the kind little blonde replied. She added, daringly, "All I can say is, I set up till two last night to finish it." "And you advise me to buy it?" "Well, we're not allowed to do that, exactly. I can only tell you what I know." "But if I take it, and it isn't what I expected, I can return it and get my money back?" "That's something I never was asked before. Mr. Jeffers! Mr. Jeffers!" she called to a floor-walker passing near; and when he stopped and came up to the counter, she put the case to him. He took the book from Erlcort's hand and examined the outside of it curiously if not critically. Then he looked from it to Erlcort, and said, "Oh, how do you do again! Well, no, sir; I don't know as we could do that. You see, you would have to read it to find out that you didn't want it, and that would be like using or wearing an article, wouldn't it? We couldn't take back a thing that had been used or worn--heigh?" "But you might have some means of knowing whether a book is good or not?" "Well, yes, we might. That's a point we have never had raised before. Miss Prittiman, haven't we any means of knowing whether a book's something we can guarantee or not?" "Well, Mr. Jeffers, there's the publisher's advertisement." "Why, yes, so there is! And a respectable publisher wouldn't indorse a book that wasn't the genuine article, would he now, sir?" "He mightn't," Erlcort said, as if he felt the force of the argument. "And there are the notices in the newspapers. They ought to tell," Miss Prittiman added, more convincingly. "I don't know," she said, as from a sensitive conscience, "whether there have been any about this book yet, but I should think there would be." "And in the mean time, as you won't guarantee the book so that I can bring it back and get my money if I find it worthless, I must accept the publisher's word?" Erlcort pressed further. "I should think you could do that," the floor-walker suggested, with the appearance of being tired. "Well, I think I will, for once," Erlcort relented. "But wait! What does the publisher say?" "It's all printed on this slip inside," the blonde said, and she showed it as she took the book from him. "Shall I send it? Or will you--"
"No, no, thank you, I'll take it with me. Let me--"
He kept the printed slip and began to read it. The blonde wrapped the book up and laid it with a half-dollar in change on the counter before Erlcort. The floor-walker went away; Erlcort heard him saying, "No, madam; toys on the fifth floor, at the extreme rear, left," while he lost himself in the glowing promises of the publisher. It appeared that the book he had just bought was by a perfectly new author, an old lady of seventy who had never written a novel before, and might therefore be trusted for an entire freshness of thought and feeling. The plot was of a gripping intensity; the characters were painted with large, bold strokes, and were of an unexampled virility; the story was packed with passion from cover to cover; and the reader would be held breathless by the author's skill in working from the tragic conditions to an all-round happy conclusion. From time to time Erlcort heard the gentle blonde saying such things as, "Oh yes; it's the best-seller, all right," and, "All I can say is I set up till two o'clock in the morning to finish it," and, "Yes, ma'am; it's by a new writer; a very old lady of seventy who is just beginning to write; well, that's what I _heard_." On his way up-town in the Subway he clung to the wonted strap, unsupported by anything in the romance which he had bought; and yet he could not take the book back and get his money, or even exchange it for some article of neckwear or footwear. In his extremity he thought he would try giving it to the trainman just before he reached his stop. "You want to _give_ it to me? Well, that's something that never happened to me on _this_ line before. I guess my wife will like it. I--_1009th Street! Change for East Brooklyn and the Bronx!_" the guard shouted, and he let Erlcort out of the car, the very first of the tide that spilled itself forth at the station. He called after him, "Do as much for you some time." The incident first amused Erlcort, and then it began to trouble him; but he appeased his remorse by toying with his old notion of a critical bookstore. His mind was still at play with it when he stopped at the bell-pull of an elderly girl of his acquaintance who had a studio ten stories above, and the habit of giving him afternoon tea in it if he called there about five o'clock. She had her ugly painting-apron still on, and her thumb through the hole in her palette, when she opened her door to him. She answered as well as she could with the brush held horizontally in her mouth while she glared inhospitably at him. "Well, not much," and then she let him in, and went and lighted her spirit-lamp. He began at once to tell her of his strange experience, and went on till she said: "Well, there's your tea. _I_ don't know what you've been driving at, but I suppose you do. Is it the old thing?" "It's my critical bookstore, if that's what you call the old thing." "Oh! _That!_ I thought it had failed 'way back in the dark ages." "The dark ages are not _back_, please; they're all 'round, and you know very well that my critical bookstore has never been tried yet. But tell me one thing: should you wish to live with a picture, even for a few hours, which had been painted by an old lady of seventy who had never tried to paint before?" "If I intended to go crazy, yes. What has all that got to do with it?" "That's the joint commendation of the publisher and the kind little blonde who united to sell me the book I just gave to that poor Subway trainman. Do you ever buy a new book?" "No; I always borrow an old one." "But if you _had_ to buy a new one, wouldn't you like to know of a place where you could be sure of getting a good one?" "I shouldn't mind. Or, yes, I should, rather. Where's it to be?" "Oh, I know. I've had my eye on the place for a good while. It's a funny old place in Sixth Avenue--"
"Don't interrupt--where the dearest old codger in the world is just going out of the house-furnishing business in a small way. It's kept getting smaller and smaller--I've watched it shrink--till now it can't stand up against the big shops, and the old codger told me the other day that it was no use." "No. He's not badly off, and he's going back up-state where he came from about forty years ago, and he can live--or die--very well on what he's put by. I've known him rather a good while, and we've been friends ever since we've been acquainted." "Go on," the elderly girl said. Erlcort was not stopping, but she spoke so as to close her mouth, which she was apt to let hang open in a way that she did not like; she had her intimates pledged to tell her when she was doing it, but she could not make a man promise, and she had to look after her mouth herself with Erlcort. It was not a bad mouth; her eyes were large, and it was merely large to match them. "When shall you begin--open shop?" she asked. "My old codger's lease expires in the fall," he answered, "but he would be glad to have me take it off his hands this spring. I could give the summer to changing and decorating, and begin my campaign in the fall--the first of October, say. Wouldn't you like to come some day and see the old place?" "I should love it. But you're not supposing I shall be of the least use, I hope? I'm not decorational, you know. Easel pictures, and small ones at that." "Of course. But you are a woman, and have ideas of the cozy. I mean that the place shall be made attractive." "Do you think the situation will be--on Sixth Avenue?" "It will be quaint. It's in a retarded region of low buildings, with a carpenter's shop two doors off. The L roars overhead and the surface cars squeal before, but that is New York, you know, and it's very central. Besides, at the back of the shop, with the front door shut, it is very quiet." The next day the friends lunched together at an Italian restaurant very near the place, and rather hurried themselves away to the old codger's store. "He _is_ a dear," Margaret whispered to Erlcort in following him about to see the advantages of the place. "Oh, mine's setting-hen's time," he justified his hospitality in finally asking them to take seats on a nail-keg apiece. "You mustn't think you're interruptin'. Look 'round all ye want to, or set down and rest ye." "That would be a good motto for your bookstore," she screamed to Erlcort, when they got out into the roar of the avenue. "'Look 'round all ye want to, or set down and rest ye.' Wasn't he sweet? And I don't wonder you're taken with the place: it _has_ such capabilities. You might as well begin imagining how you will arrange it." They were walking involuntarily up the avenue, and when they came to the Park they went into it, and in the excitement of their planning they went as far as the Ramble, where they sat down on a bench and disappointed some squirrels who supposed they had brought peanuts with them. They decided that the front of the shop should be elaborately simple; perhaps the door should be painted black, with a small-paned sash and a heavy brass latch. On each side should be a small-paned show-window, with books laid inside on an inclined shelving; on the door should be a modest bronze plate, reading, "The Critical Bookstore." They rejected _shop_ as an affectation, and they hooted the notion of "Ye Critical Bookstore" as altogether loathsome. The door and window would be in a rather belated taste, but the beautiful is never out of date, and black paint and small panes might be found rococo in their old-fashionedness now. There should be a fireplace, or perhaps a Franklin stove, at the rear of the room, with a high-shouldered, small-paned sash on each side letting in the light from the yard of the carpenter-shop. On the chimneypiece should be lettered, "Look 'round all ye want to, or set down and rest ye." The genius of the place should be a refined hospitality, such as the gentle old codger had practised with them, and to facilitate this there should be a pair of high-backed settles, one under each window. The book-counter should stretch the whole length of the store, and at intervals beside it, against the book-shelving, should be set old-fashioned chairs, but not too old-fashioned. Against the lower book-shelves on a deeper shelf might be stood against the books a few sketches in water-color, or even oil. This was Margaret Green's idea. "And would you guarantee the quality?" Erlcort asked. "Perhaps they wouldn't be for sale, though if any one insisted--"
"I see. Well, pass the sketches. What else?" "Well, a few little figures in plaster, or even marble or bronze, very Greek, or very American; things in low relief." "Pass the little figures and low reliefs. But don't forget it's a _bookstore_." "Oh, I won't. The sketches of all kinds would be strictly subordinated to the books. If I had a tea-room handy here, with a table and the backs of some menus to draw on, I could show you just how it would look." "What's the matter with the Casino?" "Nothing; only it's rather early for tea yet." She set him the example of instantly rising, and led the way back along the lake to the Casino, resting at that afternoon hour among its spring flowers and blossoms innocent of its lurid after-dark frequentation. He got some paper from the waiter who came to take their order. She began to draw rapidly, and by the time the waiter came again she was giving Erlcort the last scrap of paper. "Well," he said, "I had no idea that I had imagined anything so charming! If this critical bookstore doesn't succeed, it'll be because there are no critics. But what--what are these little things hung against the partitions of the shelves?" "But why mirrors of any shape?" "Nothing; only people like to see themselves in a glass of any shape. And when," Margaret added, in a burst of candor, "a woman looks up and sees herself with a book in her hand, she will feel so intellectual she will never put it down. She will buy it." "Margaret Green, this is immoral. Strike out those mirrors, or I will smash them every one!" "Oh, very well!" she said, and she rubbed them out with the top of her pencil. "If you want your place a howling wilderness." He looked at the ruin her rubber had wrought. "They _were_ rather nice. Could--could you rub them in again?" "Not if I tried a hundred years. Besides, they _were_ rather impudent. What time is it?" "No time at all. It's half-past three." "Dear me! I must be going. And if you're really going to start that precious critical bookstore in the fall, you must begin work on it right away." "Reading up for it. If you're going to guarantee the books, you must know what's in them, mustn't you?" He realized that he must do what she said; he must know from his own knowledge what was in the books he offered for sale, and he began reading, or reading _at_, the new books immediately. He was a good deal occupied by day with the arrangement of his store, though he left it mainly with the lively young decorator who undertook for a lump sum to realize Margaret Green's ideas. It was at night that he did most of his reading in the spring books which the publishers were willing to send him gratis, when they understood he was going to open a bookstore, and only wanted sample copies. As long as she remained in town Margaret Green helped him read, and they talked the books over, and mostly rejected them. By the time she went to Europe in August with another elderly girl they had not chosen more than eight or ten books; but they hoped for better things in the fall. Word of what he was doing had gone out from Margaret, and a great many women of their rather esthetic circle began writing to him about the books they were reading, and commending them to him or warning him against them. The circle of his volunteer associates enlarged itself in the nature of an endless chain, and before society quite broke up for the summer a Sympathetic Tea was offered to Erlcort by a Leading Society Woman at the Intellectual Club, where he was invited to address the Intellectuals in explanation of his project. This was before Margaret sailed, and he hurried to her in horror. "Why, of course you must accept. You're not going to hide your Critical Bookstore under a bushel; you can't have too much publicity." The Leading Society Woman flowed in fulsome gratitude at his acceptance, and promised no one but the club should be there; he had hinted his reluctance. She kept her promise, but among the Intellectuals there was a girl who was a just beginning journalist, and who pumped Erlcort's whole scheme out of him, unsuspicious of what she was doing, till he saw it all, with his picture, in the Sunday Supplement. She rightly judged that the intimacy of an interview would be more popular with her readers than the cold and distant report of his formal address, which she must give, though she received it so ardently with all the other Intellectuals. They flocked flatteringly, almost suffocatingly, around him at the end. His scheme was just what every one had vaguely thought of: something must be done to stem the tide of worthless fiction, which was so often shocking as well as silly, and they would only be too glad to help read for him. They were nearly all just going to sail, but they would each take a spring book on the ship, and write him about it from the other side; they would each get a fall book coming home, and report as soon as they got back. His scheme was discussed seriously and satirically by the press; it became a joke with many papers, and a byword quickly worn out, so that people thought that it had been dropped. But Erlcort gave his days and nights to preparation for his autumnal campaign. He studied in careful comparison the reviews of the different literary authorities, and was a little surprised to find, when he came to read the books they reviewed, how honest and adequate they often were. He was obliged to own to himself that if people were guided by them, few worthless books would be sold, and he decided that the immense majority of the book-buyers were not guided by the critics. 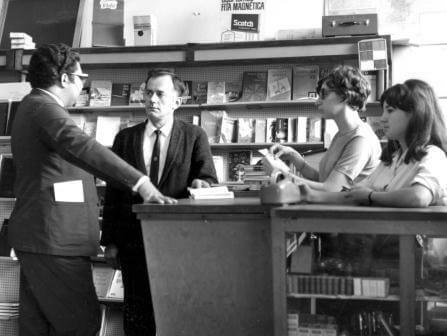 The publishers themselves seemed not so much to blame when he went to see them and explained his wish to deal with them on the basis of a critical bookseller. They said they wished all the booksellers were like him, for they would ask nothing better than to publish only good books. The trouble, they said, lay with the authors; they wrote such worthless books. Or if now and then one of them did write a good book and they were over-tempted to publish it, the public united in refusing to buy it. So he saw? But if the booksellers persisted in selling none but good books, perhaps something might be done. At any rate they would like to see the experiment tried. Erlcort felt obliged to read the books suggested to him by the endless chain of readers who volunteered to read for him, on both sides of the ocean, or going and coming on the ocean. Mostly the books they praised were abject rubbish, but it took time to find this out, and he formed the habit of reading far into the night, and if he was very much vexed at discovering that the book recommended to him was trash, he could not sleep unless he took veronal, and then he had a ghastly next day. He did not go out of town except for a few brief sojourns at places where he knew cultivated people were staying, and could give him their opinions of the books he was reading. When the publishers began, as they had agreed, to send him their advance sheets, the stitched but unbound volumes roused so much interest by the novelty of their form that his readers could not give an undivided attention to their contents. He foresaw that in the end he should have to rely upon the taste of mercenaries in his warfare against rubbish, and more and more he found it necessary to expend himself in it, to read at second hand as well as at first. His greatest relief was in returning to town and watching the magical changes which the decorator was working in his store. This was consolation, this was inspiration, but he longed for the return of Margaret Green, that she might help him enjoy the realization of her ideas in the equipment of the place; and he held the decorator to the most slavish obedience through the carpenters and painters who created at his bidding a miraculous interior, all white, or just off-white, such as had never been imagined of a bookstore in New York before. It was actually ready by the end of August, though smelling a little of turpentine still, and Erlcort, letting himself in at the small-paned black door, and ranging up and down the long, beautiful room, and round and round the central book-table, and in and out between the side tables, under the soft, bright shelving of the walls, could hardly wait the arrival of the _Minnedingdong_ in which the elderly girl had taken her passage back. One day, ten days ahead of time, she blew in at the front door in a paroxysm of explanation; she had swapped passages home with another girl who wanted to come back later, while she herself wanted to come back earlier. She had no very convincing reason for this as she gave it, but Erlcort did not listen to her reason, whatever it was. He said, between the raptures with the place that she fell in and out of, that now she was just in time for the furnishing, which he never could have dared to undertake alone. In the gay September weather they visited all the antiquity shops in Fourth Avenue, and then threw themselves frankly upon reproductions, which they bought in the native wood and ordered painted, the settles and the spindle-backed chairs in the cool gray which she decided was the thing. In the same spirit they bought new brass fire-irons and new shovel and tongs, but all very tall and antique-looking, and then they got those little immoral mirrors, which Margaret Green attached with her own hands to the partitions of the shelving. She also got soft green silk curtains for the chimney windows and for the sash of the front door; even the front windows she curtained, but very low, so that a salesman or a saleswoman could easily reach over from the interior and get a book that any customer had seen from the outside. One day when all this was done, and Erlcort had begun ordering in a stock of such books as he had selected to start with, she said: "You're looking rather peaked, aren't you?" "Well, I've been _feeling_ rather peaked, until lately, keeping awake to read and read _after_ the volunteer readers." "You mean you've lost sleep?" "Well, you mustn't. How many books do you start with?" "Good ones? It's a lot, isn't it? I didn't suppose there were so many." "Well, to fill our shelves I shall have to order about a thousand of each." "You'll never sell them in the world! You'll be ruined." "Oh no; the publishers will take them back." "How nice of them! But that's only what painters have to do when the dealers can't sell their pictures." A month off, the prospect was brilliant, and when the shelves and tables were filled and the sketches and bas-reliefs were stuck about and the little immoral mirrors were hung, the place was charming. The chairs and settles were all that could be asked; Margaret Green helped put them about; and he let her light the low fire on the hearth of the Franklin stove; he said he should not always burn hickory, but he had got twenty-four sticks for two dollars from an Italian in a cellar near by, and he meant to burn that much. She upbraided him for his extravagance while touching the match to the paper under the kindling; but October opened cold, and he needed the fire. The enterprise seemed rather to mystify the neighborhood, and some old customers of the old codger's came in upon one fictitious errand and another to see about it, and went away without quite making it out. It was a bookstore, all right, they owned in conference, but what did he mean by "critical"? The first _bona fide_ buyer appeared in a little girl who could just get her chin on the counter, and who asked for an egg-beater. Erlcort had begun with only one assistant, the young lady who typed his letters and who said she guessed she could help him when she was not working. She leaned over and tried to understand the little girl, and then she called to Erlcort where he stood with his back to the fire and the morning paper open before his face. "Mr. Erlcort, have we got a book called _The Egg-beater_?" "_The Egg-beater?_" he echoed, letting his paper drop below his face. "No, no!" the little girl shouted, angrily. "It _ain't_ a book. It's a thing to beat eggs with. Mother said to come here and get it." "Well, she's sent you to the wrong place, little girl. You want to go to a hardware-store," the young lady argued. "Well, this is the _right_ place. Mother said to go to 1232. I guess she knows. She's an old customer." "_The Egg-beater! The Egg-beater!_" the blithe young novelist to whom Erlcort told the story repeated. He was still happy in his original success as a best-seller, and he had come to the Critical Bookstore to spy out the stock and see whether his last novel was in it; but though it was not, he joyously extended an acquaintance with Erlcort which had begun elsewhere. "_The Egg-beater?_ What a splendid title for a story of adventure! Keep the secret of its applicability to the last word, or perhaps never reveal it at all, and leave the reader worrying. That's one way; makes him go and talk about the book to all the girls he knows and get them guessing. Best ad. in the world. _The Egg-beater!_ Doesn't it suggest desert islands and penguins' nests in the rocks? Fellow and girl shipwrecked, and girl wants to make an omelette after they've got sick of plain eggs, and can't for want of an egg-beater. Heigh? He invents one--makes it out of some wire that floats off from the wreck. See? When they are rescued, she brings it away, and doesn't let him know it till their Iron Wedding Day. They keep it over his study fireplace always." This author was the first to stretch his legs before Erlcort's fire from his seat on one of the reproductions. He could not say enough of the beauty of the place, and he asked if he might sit there and watch for the old codger's old customers coming to buy hardware. There might be copy in it. But the old customers did not come so often as he hoped and Erlcort feared. Instead there came _bona fide_ book-buyers, who asked some for a book and some for a particular book. The first were not satisfied with the books that Erlcort or his acting saleslady recommended, and went away without buying. The last were indignant at not finding what they wanted in Erlcort's selection. "Why don't you stock it?" they demanded. "Because I don't think it's worth reading." "Oh, indeed!" The sarcastic customers were commonly ladies. "I thought you let the public judge of that!" "There are bookstores where they do. This is a critical bookstore. I sell only the books that _I_ think worth reading. If you had noticed my sign--"
"Oh!" the customer would say, and she, too, would go away without buying. There were other ladies who came, links of the endless chain of volunteer readers who had tried to help Erlcort in making his selection, and he could see them slyly looking his stock over for the books they had praised to him. Mostly they went away without comment, but with heads held high in the offense which he felt even more than saw. One, indeed, did ask him why he had not stocked her chosen book, and he had to say, "Well, when I came to go through it carefully, I didn't think it quite--"
"But here is _The Green Bay Tree_, and _The Biggest Toad in the Puddle_, and--"
"I know. For one reason and another I thought them worth stocking." Then another head went away high in the air, with its plumes quivering. One afternoon late a lady came flying in with all the marks, whatever they are, of transatlantic travel upon her. "I'm just through the customs, and I've motored up here the first thing, even before I went home, to stop you from selling that book I recommended. It's dreadful; and, horrors! horrors! here it is by the hundreds! Oh, Mr. Erlcort! You mustn't sell that dreadful book! You see, I had skipped through it in my berth going out, and posted my letter the first thing; and just now, coming home, I found it in the ship's library and came on that frightful episode. You know! Where-- How _could_ you order it without reading it, on a mere say-so? It's utterly immoral!" "I don't agree with you," Erlcort answered, dryly. "I consider that passage one of the finest in modern fiction--one of the most ennobling and illumining--"
"Ennobling!" The lady made a gesture of horror. "Very well! If _that_ is your idea of a critical bookstore, all I've got to say is--"
But she had apparently no words to say it in, and she went out banging but failing to latch the door which let through the indignant snort of her car as it whirled her away. She left Erlcort and his assistant to a common silence, but he imagined somehow a resolution in the stenographer not to let the book go unsearched till she had grasped the full iniquity of that episode and felt all its ennobling force. He was not consoled when another lady came in and, after drifting unmolestedly about (it was the primary rule of the place not to follow people up), stopped before the side shelf where the book was ranged in dozens and scores. She took a copy from the neat ranks, and opened it; then she lifted her head by chance and caught sight of her plume in one of the little mirrors. She stealthily lifted herself on tiptoe till she could see her face, and then she turned to the assistant and said, gently, "I believe I should like _this_ book, please," and paid for it and went out. It was now almost on the stroke of six, and Erlcort said to his assistant: "I'll close the store, Miss Pearsall. You needn't stay any longer." "All right, sir," the girl said, and went into the little closet at the rear for her hat and coat. Did she contrive to get a copy of that book under her coat as she passed the shelf where it lay? When she was gone, he turned the key in the door and went back and sat down before the fire dying on the hearth of the Franklin stove. It was not a very cheerful moment with him, but he could not have said that the day had been unprofitable, either spiritually or pecuniarily. In its experiences it had been a varied day, and he had really sold a good many books. More people than he could have expected had taken him seriously and even intelligently. It is true that he had been somewhat vexed by the sort of authority the president of the Intellectual Club had shown in the way she swelled into the store and patronized him and it, as if she had invented them both, and blamed him in a high, sweet voice for having so many _old_ books. "My idea was that it would be a place where one could come for the best of the _new_ books. But here! Why, half of them I saw in June before I sailed!" She chided him merrily, and she acted as if it were quite part of the joke when he said that he did not think a good book could age much in four months. She laughed patronizingly at his conceit of getting in the fall books by Thanksgiving; but even for the humor of it she could not let him say he should not do anything in holiday books. "I had expected to get _all_ my Christmas books of you, Mr. Erlcort," she crowed, but for the present she bought nothing. In compensation he recalled the gratitude, almost humble gratitude, of a lady (she was a lady!) who had come that day, bringing her daughter to get a book, any book in his stock, and to thank him for his enterprise, which she had found worked perfectly in the case of the book she had got the week before; the book had been an unalloyed delight, and had left a sense of heightened self-respect with her: that book of the dreadful episode. He wished Margaret Green had been there; but she had been there only once since his opening; he could not think why. He heard a rattling at the door-latch, and he said before he turned to look, "What if it should be she _now_?" But when he went to peer through the door-curtain it was only an old fellow who had spent the better part of the afternoon in the best chair, reading a book. Erlcort went back to the fire and let him rattle, which he did rather a long time, and then went away, Erlcort hoped, in dudgeon. He was one of a number of customers who had acted on the half of his motto asking them to sit down and rest them, after acting on the other half to look round all they wanted. Most of them did not read, even; they seemed to know one another, and they talked comfortably together. Erlcort recognized a companionship of four whom he had noticed in the Park formerly; they were clean-enough-looking elderly men, but occupied nearly all the chairs and settles, so that lady customers did not like to bring books and look over them in the few places left, and Erlcort foresaw the time when he should have to ask the old fellows to look around more and rest them less. In resuming his own place before the fire he felt the fleeting ache of a desire to ask Margaret Green whether it would not be a good plan to remove the motto from the chimneypiece. He would not have liked to do it without asking her; it had been her notion to put it there, and her other notion of the immoral mirrors had certainly worked well. The thoughtful expression they had reflected on the faces of lady customers had sold a good many books; not that Erlcort wished to sell books that way, though he argued with himself that his responsibility ought strictly to end with the provision of books which he had critically approved before offering them for sale. His conscience was not wholly at peace as to his stock, not only the books which he had included, but also those he had excluded. Some of these tacitly pleaded against his severity; in one case an author came and personally protested. This was the case of a book by the ex-best-seller, who held that his last book was so much better than his first that it ought certainly to be found in any critical bookstore. The proceeds of his best-seller had enabled him to buy an electric runabout, and he purred up to Erlcort's door in it to argue the matter with him. He sat down in a reproduction and proved, gaily, that Erlcort was quite wrong about it. He had the book with him, and read passages from it; then he read passages from some of the books on sale and defied Erlcort to say that his passages were not just as good, or, as he put it merrily, the same as. He held that his marked improvement entitled him to the favor of a critical bookstore; without this, what motive had he in keeping from a reversion to the errors which had won him the vicious prosperity of his first venture? Hadn't Erlcort a duty to perform in preventing his going back to the bad? Refuse this markedly improved fiction, and you drove him to writing nothing but best-sellers from now on. He urged Erlcort to reflect. They had a jolly time, and the ex-best-seller went away in high spirits, prophesying that Erlcort would come to his fiction yet. There were authors who did not leave Erlcort so cheerful when they failed to see their books on his shelves or tables. Some of them were young authors who had written their worthless books with a devout faith in their worth, and they went away more in sorrow than in anger, and yet more in bewilderment. Some were old authors who had been all their lives acceptably writing second-rate books and trying to make them unacceptably first-rate. If he knew them he kept out of their way, but the dejection of their looks was not less a pang to him if he saw them searching his stock for their books in vain. He had his own moments of dejection. The interest of the press in his enterprise had flashed through the Sunday issues of a single week, and then flashed out in lasting darkness. He wondered vaguely if he had counted without the counting-house in hoping for their continued favor; he could not realize that nothing is so stale as old news, and that no excess of advertising would have relumed those fitful fires. He would have liked to talk the case over with Margaret Green. After his first revolt from the easy publicity the reporters had first given him, he was aware of having enjoyed it--perhaps vulgarly enjoyed it. But he hoped not quite that; he hoped that in his fleeting celebrity he had cared for his scheme rather than himself. He had really believed in it, and he liked having it recognized as a feature of modern civilization, an innovation which did his city and his country credit. Now and then an essayist of those who wrote thoughtful articles in the Sunday or Saturday-evening editions had dropped in, and he had opened his heart to them in a way he would not have minded their taking advantage of. Secretly he hoped they would see a topic in his enterprise and his philosophy of it. But they never did, and he was left to the shame of hopes which had held nothing to support defeat. He would have liked to confess his shame and own the justice of his punishment to Margaret Green, but she seemed the only friend who never came near. Other friends came, and many strangers, the friends to look and the strangers to buy. He had no reason to complain of his sales; the fame of his critical bookstore might have ceased in New York, because it had gone abroad to Chicago and St. Louis and Pittsburg; people who were clearly from these commercial capitals and others came and bought copiously of his criticized stock, and they praised the notion of it in telling him that he ought to open branches in their several cities. They were all women, and it was nearly all women who frequented the Critical Bookstore, but in their multitude Margaret Green was not. He thought it the greater pity because she would have enjoyed many of them with him, and would have divined such as hoped the culture implicated by a critical bookstore would come off on them without great effort of their own; she would have known the sincere spirits, too, and could have helped direct their choice of the best where all was so good. He smiled to find that he was invoking her help, which he had no right to. His longing had no effect upon her till deep in January, when the weather was engaged late one afternoon in keeping the promise of a January thaw in the form of the worst snow-storm of the winter. Then she came thumping with her umbrella-handle at his door as if, he divined, she were too stiff-handed or too package-laden to press the latch and let herself in, and she almost fell in, but saved herself by spilling on the floor some canvases and other things which she had been getting at the artist's-materials store near by. "Don't bother about them," she said, "but take me to the fire as fast as you can," and when she had turned from snow to rain and had dripped partially dry before the Franklin stove, she asked, "Where have you been all the time?" "Waiting here for you," he answered. "Well, you needn't. I wasn't going to come--or at least not till you sent for me, or said you wanted my advice." "I don't want your advice now." "I didn't come to give it. I just dropped in because if I hadn't I should have just dropped outside. How have you been getting along with your ridiculous critical bookstore?" "Well, things are rather quiet with us just now, as the publishers say to the authors when they don't want to publish their books." "Yes, I know that saying. Why didn't you go in for the holiday books?" "How did you know I didn't?" "Lots of people told me." "Well, then, I'll tell you why. I would have had to read them first, and no human being could do that--not even a volunteer link in an endless chain." "I see. But since Christmas?" "You know very well that after Christmas the book market drops dead." "Yes, so I've been told." She had flung her wet veil back over her shoulders, and he thought she had never looked so adorably plain before; if she could have seen herself in a glass she would have found her whole face out of drawing. It seemed as if his thinking had put her in mind of them, and she said, "Those immoral mirrors are shameful." "They've sold more of the best books than anything else." "No matter. As soon as I get a little drier I shall take them down." "Very well. _I_ didn't put them up." He laid a log of hickory on the fire. "I'm not doing it to dry you quicker." "Oh, I know. I'll tell you one thing. You ought to keep the magazines, or at least the Big Four. You could keep them with a good conscience, and you could sell them without reading; they're always good." "There's an idea in that. I believe I'll try it." Margaret Green was now dry enough, and she rose and removed the mirrors. In doing this she noticed that Erlcort had apparently sold a good many of his best books, and she said: "Well! I don't see why _you_ should be discouraged." "Who said I was? I'm exultant." "Then you were exulting with the corners of your mouth down just now. Well, I must be going. Will you get a taxi to flounder over to the Subway with me?" While Erlcort was telephoning she was talking to him. "I believe the magazines will revive public interest in your scheme. Put them in your window. Try to get advance copies for it." "You have a commercial genius, Margaret Green." "When it comes to selling literature, I have. Selling art is where I fall down." "That's because you always try to sell your own art. I should fall down, too, if I tried to sell my own literature." "If I were you I should take out these settles. They simply invite loafing." "I've noticed that they seem to do that." "And better paint out that motto." "I've sometimes fancied I'd better. _That_ invites loafing, too; though some nice people like it." "Nice people? Why haven't some of them bought a picture?" He perceived that she had taken in the persistent presence of the sketches when removing the mirrors, and he shared the indignation she expressed: "Shabby things!" She stood with the mirrors under her arm, and he asked what she was going to do with them, as he followed her to the door with her other things. "Put them around the studio. But you needn't come to see the effect." "No. I shall come to see you." "I suppose you've come to pour out some more of your griefs. Well, pour away! Has the magazine project failed?" "On the contrary, it has been a _succes fou_. But I don't feel altogether easy in my mind about it. The fact is, they seem to print much more rubbish than I supposed." "Of course they do; they must; rubbish is the breath in their nostrils." She painted away, screwing her eyes almost shut and getting very close to her picture. He had never thought her so plain; she was letting her mouth hang open. He wondered why she was so charming; but when she stepped back rhythmically, tilting her pretty head this way and that, he saw why: it was her unfailing grace. She suddenly remembered her mouth and shut it to say, "Well?" "Well, some people have come back at me. They've said, What a rotten number this or that was! They were right; and yet there were things in all those magazines better than anything they had ever printed. What's to be done about it? I can't ask people to buy truck or read truck because it comes bound up with essays and stories and poems of the first quality." "No. You can't. Why," she asked, drifting up to her picture again, "don't you tear the bad out, and sell the good?" Erlcort gave a disdainful sound, such as cannot be spelled in English. "Do you know how defiantly the bad is bound up with the good in the magazines? They're wired together, and you could no more tear out the bad and leave the good than you could part vice from virtue in human nature." "I see," Margaret Green said, but she saw no further, and she had to let him go disconsolate. After waiting a decent time she went to find him in his critical bookstore. It was late in an afternoon of the days that were getting longer, and only one electric was lighted in the rear of the room, where Erlcort sat before the fireless Franklin stove, so busy at something that he scarcely seemed aware of her. "What in the world are you doing?" she demanded. He looked up. "Who? I? Oh, it's you! Why, I'm merely censoring the truck in the May number of this magazine." He held up a little roller, as long as the magazine was wide, blacked with printer's ink, which he had been applying to the open periodical. "I've taken a hint from the way the Russian censorship blots out seditious literature before it lets it go to the public." "And _what_ a mess you're making!" "Of course it will have to dry before it's put on sale." "I should think so. Listen to me, Frederick Erlcort: you're going crazy." "I've sometimes thought so: crazy with conceit and vanity and arrogance. Who am I that I should set up for a critical bookstore-keeper? What is the Republic of Letters, anyway? A vast, benevolent, generous democracy, where one may have what one likes, or a cold oligarchy where he is compelled to take what is good for him? Is it a restricted citizenship, with a minority representation, or is it universal suffrage?" "Now," Margaret Green said, "you are talking sense. Why didn't you think of this in the beginning?" "Is it a world, a whole earth," he went on, "where the weeds mostly outflourish the flowers, or is it a wretched little florist's conservatory where the watering-pot assumes to better the instruction of the rain which falls upon the just and the unjust? What is all the worthy family of asses to do if there are no thistles to feed them? Because the succulent fruits and nourishing cereals are better for the finer organisms, are the coarser not to have fodder? No; I have made a mistake. Literature is the whole world; it is the expression of the gross, the fatuous, and the foolish, and it is the pleasure of the gross, the fatuous, and the foolish, as well as the expression and the pleasure of the wise, the fine, the elect. Let the multitude have their truck, their rubbish, their rot; it may not be the truck, the rubbish, the rot that it would be to us, or may slowly and by natural selection become to certain of them. But let there be no artificial selection, no survival of the fittest by main force--the force of the spectator, who thinks he knows better than the creator of the ugly and the beautiful, the fair and foul, the evil and good." "Oh, _now_ if the Intellectual Club could hear you!" Margaret Green said, with a long, deep, admiring suspiration. "And what are you going to do with your critical bookstore?" "I'm going to sell it. I've had an offer from the author of that best-seller--I've told you about him. I was just trying to censor that magazine while I was thinking it over. He's got an idea. He's going to keep it a critical bookstore, but the criticism is to be made by universal suffrage and the will of the majority. The latest books will be put to a vote; and the one getting the greatest number of votes will be the first offered for sale, and the author will receive a free passage to Europe by the southern route." "The southern route!" Margaret mused. "I've never been that way. It must be delightful." "Then come with _me_! _I'm_ going." "I never thought of that," she said. Then, with the conscientious resolution of an elderly girl who puts her fate to the touch of any risk the truth compels, she added: "Or, yes! I _have_. But I never supposed you would ask me." She stared at him, and she was aware she was letting her mouth hang open. While she was trying for some word to close it with he closed it for her. Add The Critical Bookstore to your own personal library.